The first story I remember writing followed a group of intrepid explorers who crossed the spongy plains, climbed treacherous, steep White Mountains, swam the hot sea, and reached their destination. They were a group of strep bacteria conquering a human throat. I was eleven, and I loved twist endings. I read a lot during middle school and high school, a random mix of science fiction, fantasy, mystery, and Regency romance. In college, I signed up for British Lit classes for an excuse to read for pleasure outside my biochemistry major. My reading life-list, kept since since 1989, is twenty pages long. I guess I’m a born reader. Some people are born writers. I didn’t actually know I wanted to be an author until I hit thirty, and then I got serious. I practiced the craft for years with the help of several wonderful and generous organizations--the Society for Children’s Writers and Illustrators, the Online Writing Workshop for Science Fiction and Fantasy, and Context writing workshops. A lot of individual writing buddies supported me along the way, some ahead of me on the ladder, some a short step behind. I wrote a dozen short stories and seven novels. And then, the dream came true. Six short stories found publishers in 2010 and 2011. My indy-novel Out of Xibalba came out in 2011. 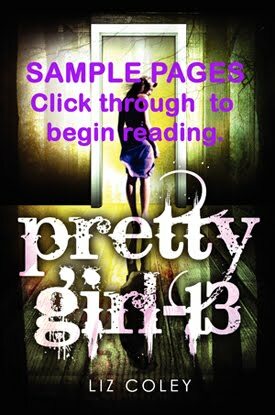 Katherine Tegen at HarperCollins bought my seventh novel Pretty Girl-13 for release in early 2013 and many international sales followed. Since then I've published the Tor Maddox "pink thriller" series, contemporary adventures featuring a heroine for our times, and The Captain's Kid, a sci-fi adventure for tweens/teens. I have lived in New York, New Jersey, Connecticut, California and Ohio and visited England, Mexico, Belize, Canada, Italy, France, Germany, Austria, Greece, Croatia, Slovenia, Bali, and Hungary. I feel incredibly lucky to have glimpsed so much of the world. Still, many of my story ideas are born in the car while I daydream and listen to the reports and interviews on NPR. I’ve been known to miss my exit and keep going for miles. I vividly remember my teenage years, and while I know things have changed, the emotions of those years are universal. I think that’s why my stories speak to teens and to people who ever were teens. I try to tell stories that will make you laugh a little, cry a little, and think about what it means to be yourself.